Location, Location and oh what a view!!! Our contemporary style studio has all the comforts of home: lovely kitchen with corian countertop, stove with oven, full updated bath, pergo flooring, cathedral ceiling/ceiling fan, loft, skylight, flat screen television and password protected WIFI.. All of the above coupled with beautiful view is what keeps our guests returning year after year. Fall asleep/wake up to the sound of waves hitting the sand just steps away. Other amenities include a beach directly across the street, deck overlooking the water, outdoor common shower, and backyard with picnic tables and charcoal grills. Being an efficiency, our condo is most suited for 2 people and sleeping loft can be used by older child/teen only. Restaurants, shops, golf, activities, ferry service to the islands are located only minutes away. You can walk to a few restaurants right from the condo. Please note LINENS ARE NOT INCLUDED, therefore, If you are traveling from afar, there is a linen rental company you can rent your linens through if you wish. That info can be provided for those who will need that service. There is a designated parking spot for one car. Pictures speak for themselves. Book early for prime summer weeks and take advantage off season rates for early summer and Fall. Peak Season minimum stay 7 nights with check in on Saturday to Saturday only. Please note, No Pets and No Smoking allowed in unit/on property grounds. You must be at least 21 years of age or older to rent this property and sign off on an agreement. Peak season rentals are Saturday to Saturday requiring a 7 or 14 night minimum. Offseason check in/check out dates are flexible. There is a $45 cleaning fee and $200 fully refundable security deposit. There is no security deposit required of return guests. Book early for prime 2019 weeks! *Amenities:Ocean view, private beach, deck, A/c, ceiling fan, microwave, full stove, flat screen TV, coffee maker, updated kitchen, cable TV with HBO, common charcoal grills and,picnic tables, outdoor common shower. *Activities: There are many activities to keep you busy on your vacation. Rent an electric paddle boat or canoe/kayak and paddle your way up Swan River ending at South Village Beach. Try a Whale Watch out of neighboring Harwichport or take a cruise around Hyannisport Harbor. Antique shops galore line historic route 6A in Dennis. Golf, hiking and bike rentals are close by. Ferry service to Martha's Vineyard and Nantucket are just minutes away. Activities are endless on beautiful Cape Cod. *Area: Dennisport is located approximately one and one-half hours from Boston. It is centrally located in the middle of Cape Cod, making it convenient for day trips to either direction of the cape. This area offers some of the best restaurants featuring the freshest of seafood. Cape Cod Mall in Hyannis is 20 minutes away, but shops of all kinds stretch for miles on route 28, which is five minutes from the condo. We've vacationed on Cape since we ourselves were children. 20 years ago, we purchased our first little condo and the rest is history! 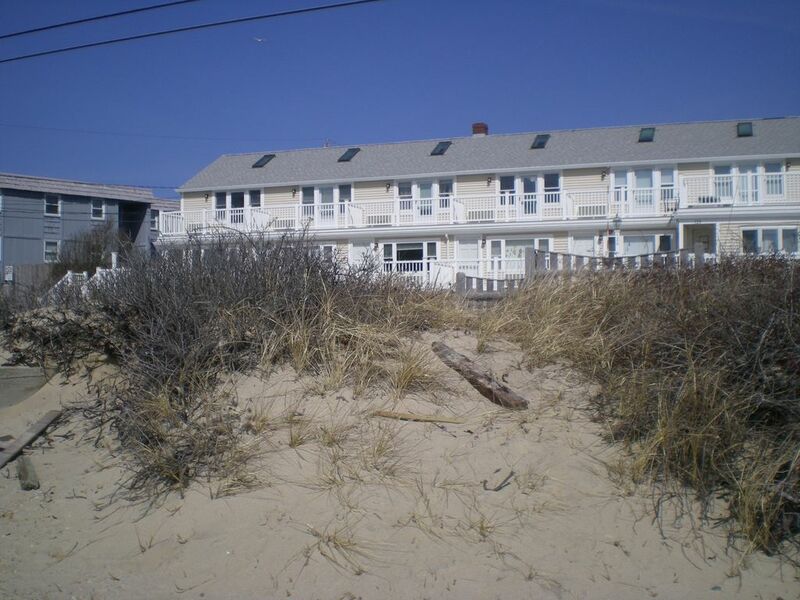 We now own 4 properties in Dennisport and rent out three of them. We have many return guests at all three year after year. It's a perfect location being mid cape with plenty of things to do. Our two daughters and their families love Dennisport for just that reason. I'm happy to answer any questions you may have. I respond within 24 hours if not sooner. Thank you!! We purchased Oceanwinds for the beautiful view. It sold us the second we walked in the door!! Our condo is an end unit for added privacy. It also has a lovely view. Makes it a special place to vacation at because you will always feel like you've been away with the view! Lovely place. Great location. Spotless. Comfortable. Great deck! My friend and I stayed 3 nights. The unit was very comfortable ... Good bed, good seating, well appointed. Nice and clean. If I were ever to go to Dennis Port again, I'd stay there again. Great condo- Claire was wonderful! Great experience- We will return again for sure. So glad you enjoyed your stay Thanks for the 5 star review. We appreciate our guests taking the time to review their stay. Travelling from the UK and being unfamiliar with the Cape, it would be easy to be a little bit more than apprehensive. Fortunately we came upon this place. Absolutely can not fault this accommodation . Clean, modern and above all superb location. Private beach a stone's throw, outside shower to dust the sand off on the way up to the accomodation. This place has everything you need. Morning coffee chilling on the deck, cool beer in the evening watching the world go by. The view is amazing. Great memories that will stay with us forever. The property owner was very responsive and helpful! Dennis Port is a great location to access a lot of fun activities across the Cape. There is not a washer/dryer so you need to bring your own linens or book a linen service. Really enjoyed ourselves a great area of the country over the 4th of July! Thank you so much for taking the time to post a review. It was a pleasure having you. Sorry about no W/D but most seasonal units on cape cod owned by individual owners do not have them and our cleaning companies do not do laundry and that is why I note that on my website. I’m happy you made it back west safely. You had a beautiful week weatherwise. Enjoy rest of the summer!! The property was beautiful and very much exceeded our expectations!! The studio apartment was perfect for us! W e absolutely loved staying there! We did not want to leave and hope to return in the Fall! The view of the ocean was great and we could easily walk to 3 beaches! Claire was easy to get in touch with and very friendly! We cannot say enough about this amazing "get away" on the Cape!! Thank you so much Claire and Bob! Melinda. Thank you so much for this 5 star review. Looking forward to having you back in the Fall. You guys were great to work with. Our condo is Dennisport is located 'mid cape'. We are located directly across the street from the ocean and our own small private beach. Other Activities: Activities are endless in Dennisport. Bring your bikes (or rent them at the beginning of the infamous 'cape cod bike trail' which begins right in Dennisport..Wind your way (mostly level so great for kids too) all the way to Wellfleet and beyond. Kayaking is great on Swan River which drops you into the ocean..if you don't have a kayak..no worries, rent one less than 5 minutes from the condo and launch it at the rental place right on Swan River. Golfing if fabulous..(both mini golf courses and great Par 3, 4 and 5 courses surround you. You won't be bored!! Golf: Several beautiful golf courses are just minutes away. Dennis has at least three of their own, neighboring towns also have several. Dennisport's location is superb! You can reach tip of the Cape (Provincetown) in 50 minutes, or same distance (50 minutes) to the Falmouth area of Cape Cod. Cancellation Policy - full refund if time frame can be rented Due to unit being an efficiency (no private bedroom) most suitable for 2 people. An older child/teen can sleep in 'sleeping loft'.There is a cleaning fee added of $45.00 and a fully refundable $200 security/damage deposit which will be refunded back by Homeaway to the method of payment you used to make the reservation 7 days after your departure.